This information sheet is designed to help you to understand what a knee replacement involves. I perform knee replacements frequently, several times each week and over 200 per year, and my commitment to you is to perform the surgery to the highest possible professional standards using the best available equipment, components, staff, and hospitals. If you have any problems or concerns at any stage please let me know so we can work together to achieve the best possible outcome. Knee replacement is a commonly performed operation for severe knee symptoms usually caused by osteoarthritis. Osteoarthritis is a gradual process in which the surfaces of the knee become damaged and wear away. The bones on either side of the knee joint are usually covered with a hard, smooth layer of cartilage that protects it and allows the surfaces to glide smoothly over each other. This surface can be damaged by injury or general wear and tear. When the process becomes advanced the underlying bone is uncovered. This causes pain, swelling and stiffness because the surface is no longer smooth and the nerve endings in the bone are exposed. Osteoarthritis of the knee is a very common condition. It can occur in young people following injuries, but most commonly occurs in older people. Factors that cause osteoarthritis include previous knee injury, obesity, and a family history of osteoarthritis. Knee replacement should be considered a last resort for the treatment of knee osteoarthritis. When deciding whether to have a knee replacement it is important for you to balance the severity of the current symptoms against the risks and expected outcomes from having surgery. Before considering a knee replacement you should also try non-surgical treatment. For people with moderate osteoarthritis there are very good results from physiotherapy programs and weight loss. Anti-inflammatories are the most effective tablets. 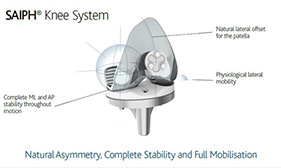 Most people who have knee replacements are very happy, however, it is a big operation and the results can be variable. It will not give you back a completely normal knee. The evidence shows that between 5 and 20% of people are not satisfied with the outcome of their knee replacement. This is often due to functional limitations (the things that they can’t do with their knee replacement) but it can also be due to pain or stiffness. In most of these people they are still better than they were before the surgery. Your operation is performed under an anaesthetic. This can be either a spinal anaesthetic (injection in the back) or a general anaesthetic (completely asleep). Most commonly it is a combination of both. Please look at the information sheet on "Anaesthesia for Major Joint Replacements" and if you have any questions for your anaesthetist prior to the surgery feel free to contact them directly (we will supply contact details when you book surgery). The risks of the anaesthetic will be explained to you prior to your operation by the anaesthetist. Your risks associated with the anaesthetic are largely related to your general health, so please let us know about all of your medical history. In particular we need to know about any problems you may have experienced with previous anaesthetics, diabetes, heart conditions and any blood thinning tablets that you may be taking (such as Plavix, Clopidigrel, Aspirin and Warfarin). These will need to be stopped or replaced some days prior to surgery. Your operation takes approximately 1.5 hours to complete. It requires a long incision over the front of the knee. The muscles are split, and the knee is exposed. The worn surfaces of the knee are removed and replaced with metal and plastic surfaces that are attached to the bone. The ends of the femur (thigh bone) and tibia (shin bone) and usually also the surface under the patella are all replaced. At the end of the operation I inject local anaesthetic into the knee to help control the pain. The anaesthetist will also often put an injection around one of the nerves in your leg to help temporarily numb the knee (this is call a femoral nerve block). Once the operation is completed I will call your contact person to let them know how it went. It is likely that you will be away from the ward for about four or five hours in total due to time preparing for the surgery and recovering afterwards. After the operation you will wake up in the recovery room with a large bandage on your knee. The amount of pain you get after the surgery is difficult to predict. With the local anaesthetic injections and pain killers we give during the surgery most people are reasonably comfortable when they wake up. We keep you for an hour or two in the recovery ward to give you strong painkillers if they are needed and then you will be transferred back to your room on the ward. It is common for your knee to become very sore as the painkillers wear off during the first 24 hours after the surgery. The nurses will be keeping a close eye on you, but it is important let them know if it is starting to get more painful, so they can give you strong painkillers if necessary. There is always a trade off with the strong painkillers as they tend to cause side effects such as nausea and constipation. About one in ten patients has problems passing urine after surgery. If this occurs a urinary catheter is used to drain your bladder. This is a thin rubber tube which is inserted into your bladder to allow urine to drain freely. Usually it is inserted on the ward after the operation, although occasionally it is inserted during the operation if we feel that there is a high risk of your bladder becoming overfilled. Most people find that the insertion of a catheter is only mildly uncomfortable and are quite relieved when their bladder is emptied. The catheter is usually removed after a day or two when your bladder is likely to be recovered from the anaesthetic. The risk of requiring a catheter is higher in people with previous urinary problems such as symptoms from prostate problems or incontinence so please let us know if you have had any problems with urination. The morning after the operation a blood test will be done to check how much blood you have lost during your operation. If your blood count is low a transfusion may be recommended. This is rare and occurs in less than 2% of patients. The physiotherapist will see you the morning after the surgery. They will help you to stand up and take your first steps on your new knee. It is completely safe to stand on your new knee and to put all your weight through it. You cannot damage it. It is very important to get out of bed and to get moving as soon as possible after surgery. The physios will take you through a series of exercises to get the knee moving and help your muscles to recover. It may take several days until your quadriceps muscles start working properly, so you are likely to not be able to lift your leg for a few days. The physios will offer you time on a machine called a CPM which helps your knee to start moving by gently and slowly bending it. You are likely to be in hospital for several days after the operation (three to five days is most common). If you want to get out of hospital sooner then talk to me before the surgery and we can aim for an earlier discharge. Most people who have surgery on Monday will go home either Friday or Saturday. This time is spent working to get the knee bending and straightening and learning to walk on it again using a walking frame or crutches. I will see you most days after the surgery. Occasionally I will have one of my colleagues covering for me if I am unavailable. In addition, a medical physician (usually Dr Adrienne Anderson) will see you daily to monitor your general health during your stay. At the end of the time in hospital most people are able to walk using crutches and negotiate stairs. You should be able to largely look after yourself at home, however, it is always beneficial to have someone at home to help. If you are slow to recover from the surgery or if you have other medical problems or no help is available at home, then we may recommend that you spend 7 to 10 days in one of the rehabilitation hospitals. This decision is usually made a couple of days after the operation when we can assess how quickly you are recovering. The most common rehabilitation hospital we use is Donvale Rehabilitation Hospital. Most people do not need a rehabilitation hospital. Before you go home the physiotherapists will give you a series of exercises to perform every day. In addition, they will help you organise ongoing outpatient physiotherapy. This can either be with the hospital physiotherapists (Physiocare) or with a physiotherapist of your own choice. We will arrange your follow-up appointment to see me again around four weeks after the operation. If you are unsure when your appointment is contact the office (9459 6611). If you have any questions or concerns before this visit call my rooms or Warringal Hospital. A knee replacement is a big operation and it is normal for your knee to be sore for several weeks after the operation. However, the amount of pain experienced varies a lot between patients. You will be sent home with some pain-relieving tablets. You may need to take some tablets for several weeks. The hospital pharmacy will give you information on the tablets which are prescribed for you. It is best to cut back on the stronger tablets such as Targin and Oxynorm/Endone, which are related to morphine, as soon as possible. They can cause drowsiness, nausea, constipation and if they are taken for too long they can lead to addiction. They are best replaced by anti-inflammatories such as Mobic and Nurofen combined with Paracetamol. Rest, elevation, and ice packs can also help to reduce the pain and swelling. It is very important to regain as much movement of the knee as soon as possible after the surgery. While these exercises may cause some pain and swelling around the knee, they are safe to do and will not do any harm to your new knee. Make sure you balance periods of exercise with periods of rest in order to control the pain and swelling. If the knee starts to become increasingly painful after you have gone home try resting it, putting on an ice pack and taking some pain relief. If it doesn’t settle or you develop any signs of an infection, such as a temperature or increasing redness around the knee, then contact my office (ph. 9459 6611), the hospital, your GP or local emergency department. You will be sent home with a narrow adhesive dressing over the wound. This will usually start to come off between 2 and 3 weeks. If it starts to peel off, you are welcome to take it off any time after 10 days from the surgery. The wound should be sealed over by this stage and you are safe to shower or wash over it. If there is any ongoing bleeding or leaking from the wound or any signs of infection at any stage after you get home, then please contact my rooms. The stitches in your knee are all absorbable, and do not need to be removed. When I see you four weeks after the operation I will check the movement and strength of your knee. It is common at this stage for the knee to still be quite sore and swollen, but it should be steadily improving. At four weeks after your surgery, many people are still using one or two crutches but as you gain strength and balance your physiotherapist will advise you to wean yourself off them. The full recovery from a knee replacement takes at least three months. While most patients are very happy with their knee (In our recent study using the newer medial pivot, knee designs we found more than 95% of people are happy with their knee replacement) the final result can be variable. The usual result is to have a knee which has no significant pain, however it may not feel like a normal knee and can feel “clicky” or uncomfortable at times. Most people can walk long distances on the flat and negotiate stairs. Younger people with heavy manual jobs (farmers, builders, etc) may struggle with some of their job or have some pain and swelling when they work. As far as sporting activities most people can play golf, bowls, tennis, swim, and ride a bike. Very few people can run after a knee replacement. Kneeling is allowed but can be difficult or uncomfortable. The final range of motion of the knee after a replacement is also variable. The average range is from full extension (straight) to about 115 degrees of bending. Very few knees ever gain full bending after replacement and it is possible to have less movement of the knee after replacement than beforehand. Occasionally the final result from a knee replacement is not as good as we would like due to persisting pain and/or stiffness. In these cases, we will investigate with x-rays and scans to try and find the reason. Sometimes we are able to find the problem and fix it with physiotherapy or injections or further surgery. 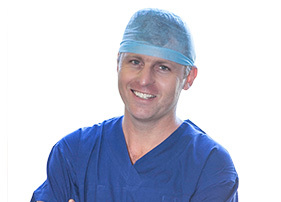 The most common extra operation would be a Manipulation under anaesthesia which involves a very quick general anaesthetic to allow me to bend your knee for you. I will recommend this if you are not bending your knee to 90° by 6 weeks. Infection in the knee joint occurs in less than 1 in 200 operations. It can require further surgery to wash out the infection. If the knee replacement becomes infected it may need to be completely removed and replaced with a new one. Infection is more common in patients who are overweight or who have Occasionally infections can develop several years after the initial surgery. DVT (deep vein thrombosis) is a blood clot that forms in the leg veins and can occasionally break off and go to the lungs (pulmonary embolism). It can happen after any surgery and usually causes increasing pain in the calf muscle a few days after the surgery. To decrease your risk of a DVT you will be given injections (Clexane) and tablets (Xarelto) after your operation. DVT is more common in people who have had one before. Tender scars and numb patches. When we make the long incision down the front of your knee we cut small skin nerves that come across the front. This causes a permanent numb patch on the front of your knee and the nerve endings are occasionally tender or painful. Nerve or blood vessel damage is a very rare but very serious complication of knee If the nerves to the leg are stretched or damaged it can cause paralysis and loss of feeling. If the blood vessels are damaged they may need to be repaired and there is a risk that the leg may not get enough blood flow. As the knee replacement is a mechanical joint it can wear out or become loose over If this happens part or all of the knee replacement may need to be changed. It is very uncommon for this to happen in the first 10 years and most knee replacements last at least 20years. If you have any further questions after reading this information, please contact my rooms and arrange another time to talk to me. I also suggest that you read the accompanying College of Surgeons handout on Knee Replacement and Anaesthesia for Major Joint Replacement. Contact your insurance company to confirm that you are covered for knee They will ask you for the Item Number for the operation, which is likely to be49518. Bring all of your x-rays to the hospital – we do not routinely keep patient x-rays so if you think we have yours please call to If we were able to access the films on-line in my office, then we will be able to do that again. If you have any problems or concerns about your knee replacement surgery, please let me know so we can work together to get you the best possible outcome.